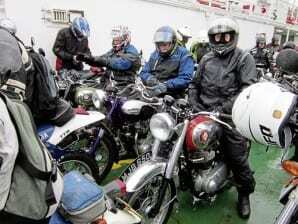 The spirit of the Moidart Run is encapsulated by this scene aboard the Corran Ferry – and the gloves are definitely not coming off yet! A cold, wet, sleety, drizzle was falling as around 80 hardy and determined enthusiasts (nutters?) assembled in the viaduct car park in Kinlochleven for a 120-mile round trip taking in some of Scotland’s finest scenery. The West Highlands in early summer can be roasting hot or freezing cold – and this year it was definitely the latter! Now in its seventh year, the Moidart Run has firmly established itself as the opener to a brilliant three days of classic motorcycling in and around Kinlochleven, the main event being the world-famous Pre-65 Scottish Two-Day Trial on the Friday and Saturday.